Oh, the places you’ll go! Join us Saturday, March 2 as Watermark celebrates Read Across America Day and the birthday of Dr. Seuss. We have fun activities planned for readers of all ages. Whether you love to read a funny story to preschoolers or prefer discussing the latest novel with other adults, there’s a way for you to join the celebration. This article from Watermark shares more ways to celebrate the joy of reading. Invite kids to visit a Watermark library. 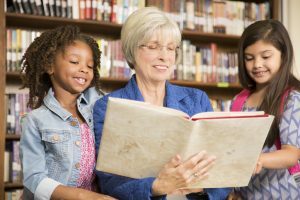 Community associates and residents can read to them, talk about reading and show how a person can explore different times and places through the magic of words. Join a book club in your Watermark community. It’s a great way to build meaningful connections with fellow readers. We have multiple book clubs, book reviews, and short story groups across all the neighborhoods at St. Andrew’s Village. Ask about accommodations for those with low vision. Watermark Retirement Communities are dedicated to providing support and tools to help our residents thrive. For those with low vision, we have members from the Colorado Center for the Blind who come each month to run a support group and discuss resources and technology that can benefit those with low vision.